We have just released Mobile Joomla! 2.1.34 and updates to all our premium templates: Mobile Elegance 2.0.22, Mobile Flat 2.0.19, Mobile Square 1.0.13, and Mobile iOS9 1.0.14. Mobile Joomla! 2.1.34 fixes "Mobile - Proxy Module" module: unpublished modules are not displayed anymore, and displayed module inherits "Show Title" and "Module Class Suffix" options of the Proxy Module, so that it's possible to make displayed module opened, inset, popup, or unstyled as described in the Insider's Guide. Other changes are common for preinstalled Mobile Basic template and premium templates: there are fixes/improvements in layouts of Menu module, Login module, Content component, Users component. As always, you can update to the new version from your administrative panel via the Mobile Joomla! Remote Update feature, or by downloading the Mobile Joomla! package and installing it from the backend. Do not forget to backup your website before the update! Remember to subscribe to our RSS feed, follow us on Twitter and like our Facebook page to keep on top of all latest Mobile Joomla! news. The issue with lazy image loading ("a problem of disappeared images") has been fixed. Local device database (AMDD) has been updated: many new devices are added, and ALL old devices (that we don't see in logs for more than three years) are removed to reduce database size and improve lookup performance. As normal, please take a backup before upgrading to the new versions. This new Mobile Joomla! version includes the following updates, including a security update for the free Community version users. If you use the Community version 2.1.24, please update to the latest version. Security info for the users of Community version 2.1.24: previously the Community version added a file called ads.txt (recommended by Google) if it was missing from your webserver in order to show the support ads. This on the other hand meant that if you were also showing ads on your site and did not notice Google's notification about adding your own domain(s) to the file, there may have been a risk that you might have lost some advertising impressions. However, the new version 2.1.25 has been updated so that the ads.txt file is not created unless it already exists. If it exists, MJ simply adds a clearly marked line in the file. The line is removed if MJ is uninstalled. If you use the Community version 2.1.24, please update to this latest version 2.1.25. Hey there! We have just released Mobile Joomla! 2.1.11 with these following changes. 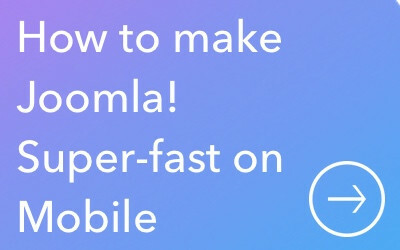 Become Mobile Joomla! 2.0 Beta Tester!